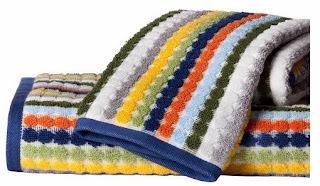 Anyway, I found a fun towel that tied the whole room together - the blue/green/brown from the beds and the reds/oranges/yellows in the rug YAY! So that above turned into this below! Soft and snugly :) Slips on like a pillowcase, too. Easy thing to make - took about 15 mins (with all the cutting and pinning). What do you think? Have you gotten your craft on lately?